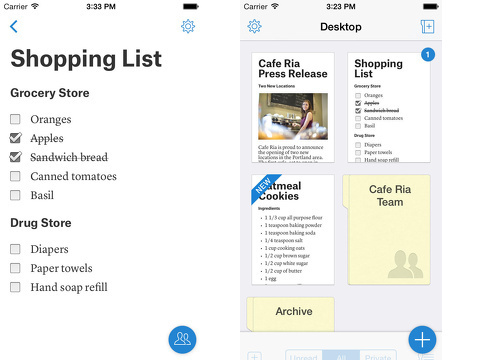 The Quip iPhone, iPod Touch, and iPad app is a lean, mean, and intuitive document app. It takes the basic idea of Google Drive, but it adds finesse, style, and tools to build and share beautiful documents. It syncs across your devices and online. This download from the iTunes App Store packs a powerful punch – great tools and user experience – for free. You create an account with Quip via Google. You enter your Google password and authorize access to your basic info and manage contacts. The process is seamless and quick. Your contacts are scanned, and Quip users are identified. You may invite other contacts to join Quip. The home screen is a list of your documents. The document most recently edited is first. You tap the plus icon to create a document. You touch the person icon to invite a user. You can import documents from Dropbox, Evernote, Google, and email. You slide your finger down from the top of the inbox to reveal folders where you can organize your documents. The process to create a document is simple, yet filled with customization options. The keyboard slides up from the bottom of the screen. The keyboard has a row of icons to identify text category, add a comment, as well as insert items like photos, charts, and documents. Text may be headline, list, or paragraph format. You type your content and insert items to build your document. The settings wheel in the upper right corner gives you the chance to share, copy, link, convert to PDF, and print. It also gives you the change your theme between five different options. A tap instantly changes the look on the upper portion of the screen. The interface of the keyboard and the editing tools adjusts frequently to complement the action. It is quick and agile to add photos, and the option to use the most recent photo with one touch is brilliant. When you create a table, you double tap on a row and options appear to edit a table like the iOS copy and paste toolbar. Instead, you can add and delete rows and columns. For a list, the icons change at the top of the keyboard to change list style, justification, and bullet point graphics. You can add comments that are viewed in a social-network-style conversation thread. You type @, then a menu opens to add image, table, person, link to documents and web pages. Edits are called “diffs.” Red text with a line through the word is language that was removed, and green text with underline is added language. 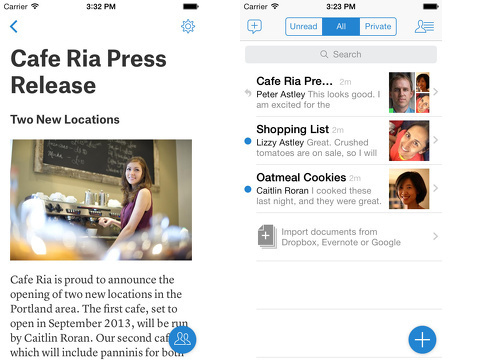 The options to use Quip are endless and range from the mundane to business necessities. I made a grocery list with pictures that my husband could check off. If you are planning an event, you could use it to create an itemized punch list and calendar. Instead of searching through your email to remember the decision made, the chat is available instantly with Quip. It is refreshing, exciting, and leads to a highly productive life. AppSafari review of Quip was written by Jenni Ward on May 23rd, 2014 and categorized under App Store, Enterprise, Free, iPad apps, Productivity, Universal, Utilities. Page viewed 11443 times, 2 so far today. Need help on using these apps? Please read the Help Page. website, and post is in fact fruitful in support of me, keep up posting such content. Good review, I will try this app! Very good I love the app. great! this app is essential for me. Continue with great posts same it. Muito bom, adorei as dicas deste site, vou voltar sempre aqui. Did not like. I’ve seen better ones .. I will try this app! I would like to know if is it possible to share a list with someone that doesn’t have the app? Thanks for your useful posts!